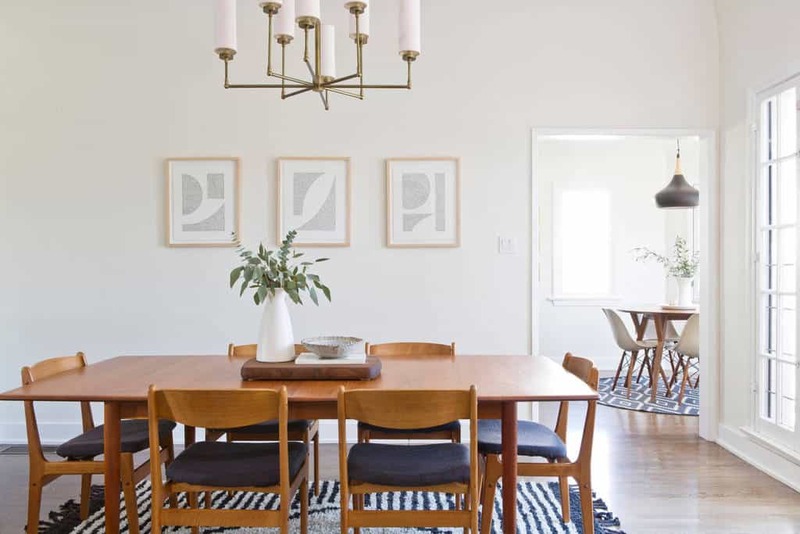 We know that you’re stylish but even the most fashionable among us can get into a bit of a rut with their dining room. Like the kitchen, bathroom, and master bedroom, the dining room is a room that we can sometimes end up taking for granted. Time to start thinking differently! Below, you will feast your eyes on 54 colorful images of stunningly stylish design ideas for the dining room. 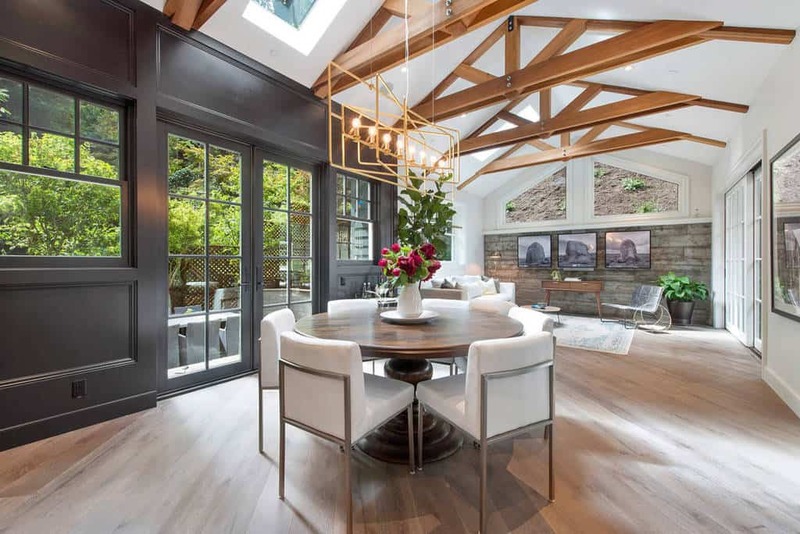 Whether you are interested in re-doing your whole dining room or just adding some design accents, you’re sure to find a lot of inspiration here. Just a few examples of the kinds of ideas you will find here include: midnight blue walls and cream country cabinets, artistic elegance and garden rattan chairs, raspberry tints and pink chocolate combinations, gilded charm, and refreshing combinations of emerald and mint. Enjoy, and good luck with your designing adventure! Don’t be afraid to mix patterns, letting your taste be your guide. This dining room does this successfully, with mild pinstripes, geometric zigzags, and even a leopard print. 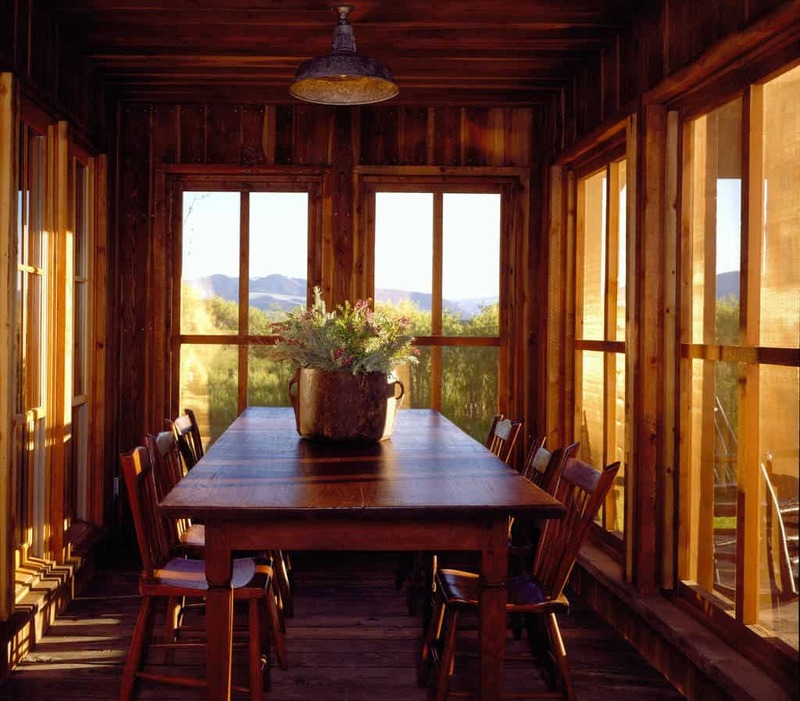 These glossy oak window frames complement the decor of the dining room as a whole. Photo by Aline Architecture inc. 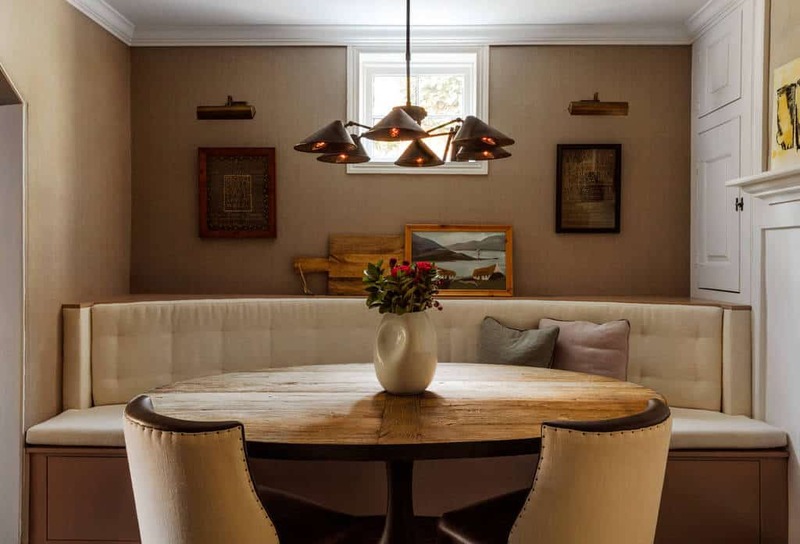 This banquette features useful yet decorative drawers for convenient storage. 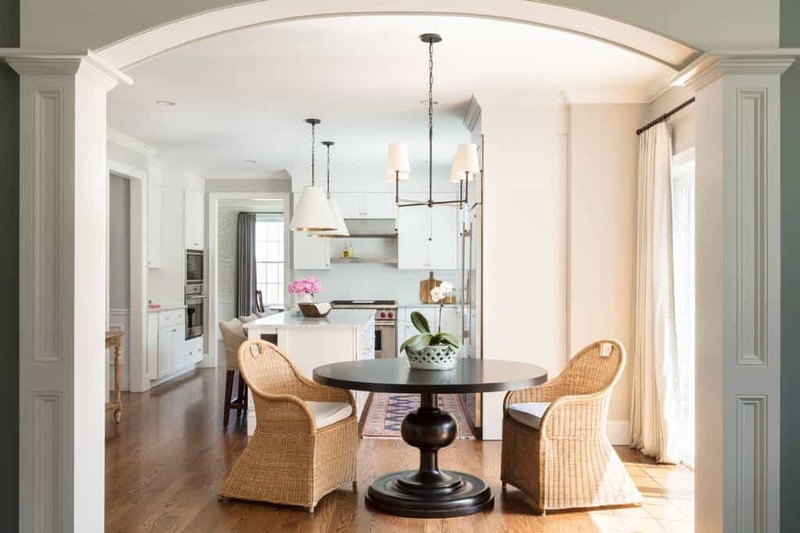 This sunny and pleasant room successfully mixes rattan chairs with a classic mahogany table. This ceiling boasts not only molding but also a decorative pattern that creates an artistic look. Photo by Mondo Builders, Inc. This classically beautiful dining room features wonderfully colorful art on the walls, elegant chairs, and a gleaming mahogany table. 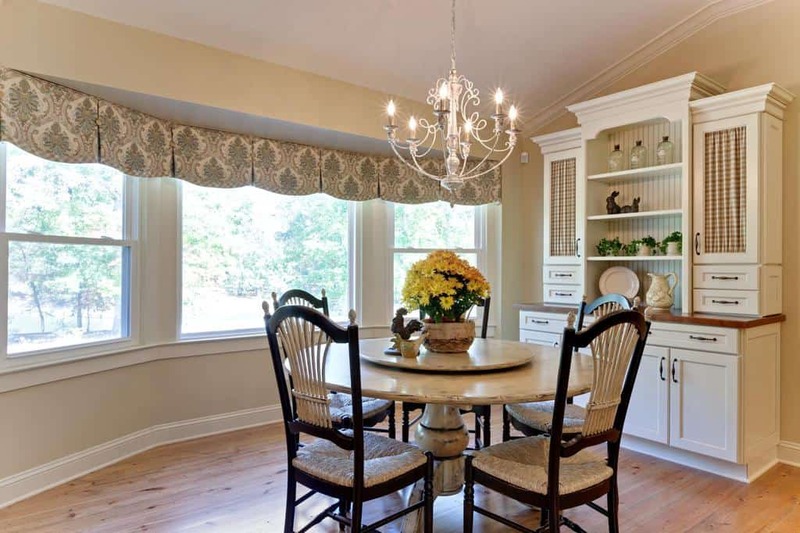 This dining room’s cream-colored display and storage cabinetry gains a distinctly countrified look from the presence of gingham curtains and simple crockery. 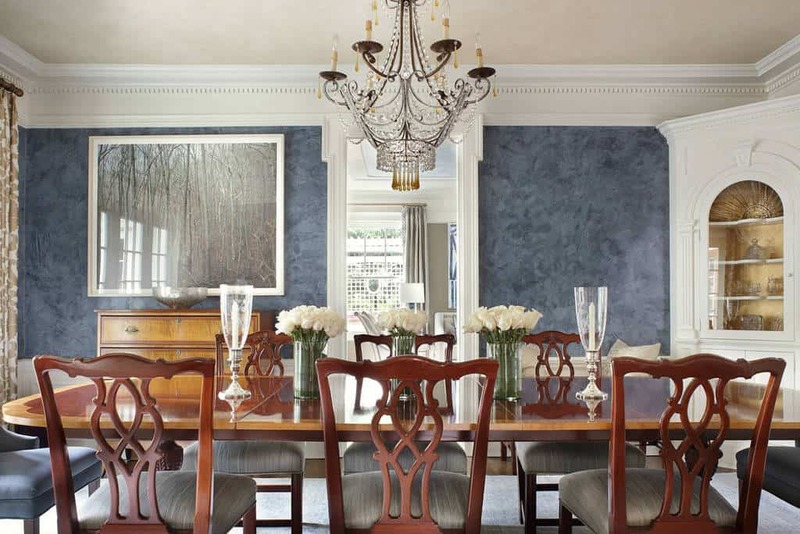 One wall in midnight blue is a standout feature in this combined kitchen and dining room. Two of this dining room’s most attractive features are its decorative splashes, including a colorful art print and a sunburst motif wall decoration. This dining room’s artwork are not only decorative but will always serve as great conversation pieces for dinner parties. This room in a pale and pretty shade of rose features textured wall panels and chairs in a beautiful classic design. 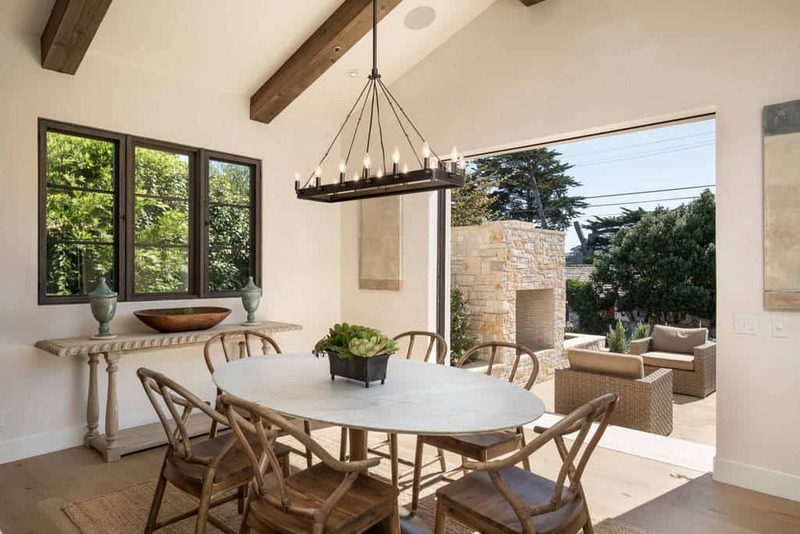 This minimalistic dining room is a hidden hideaway where family and friends can enjoy themselves. 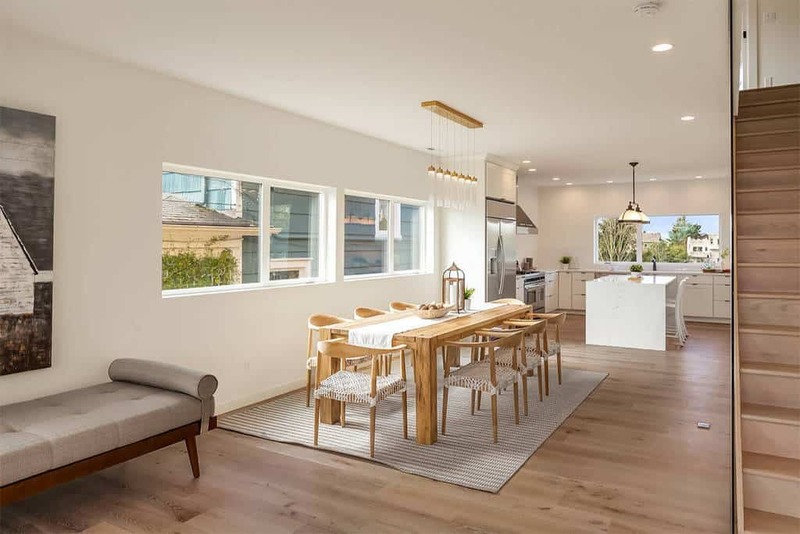 This combined dining room and kitchen has entirely modern design elements, such as a spacious, uncluttered kitchen area and a dining room table that is stylish yet as simple as can be. This abstract design painted directly on the wall creates a daringly unique look, as does the funnel-shaped chandelier. 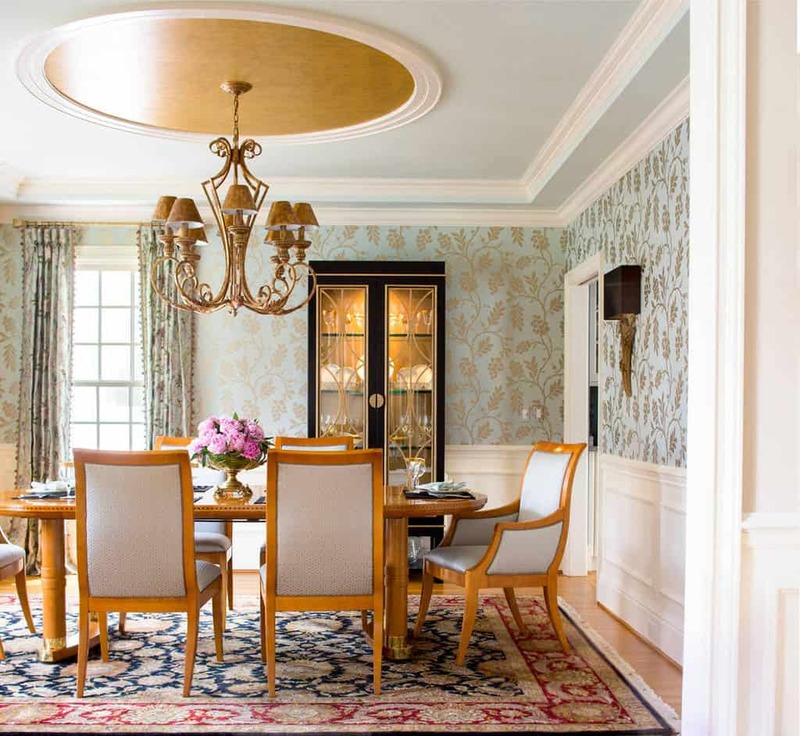 This dining room features a gilded circular ceiling panel from which hangs a grand gold-toned chandelier. The wallpapers have a lovely gold and blue floral design, and there are also complementary tones of gold in the rug. 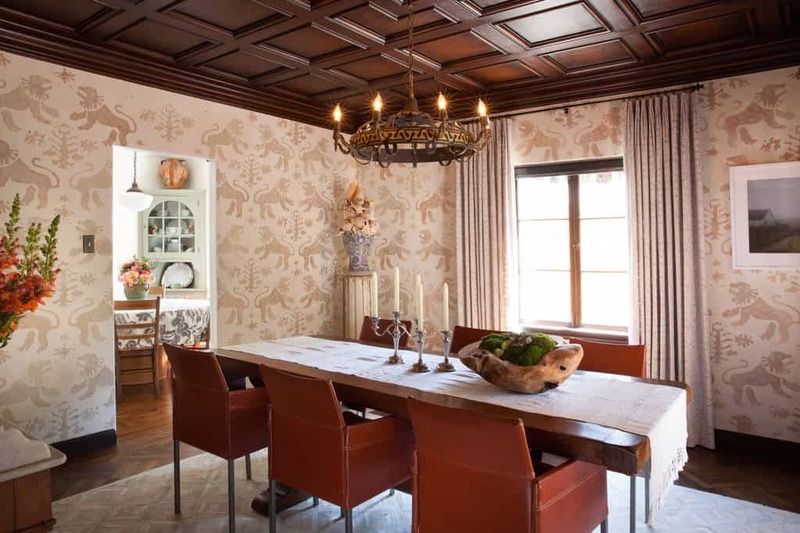 This space’s stunning mahogany paneled ceiling is beautifully complemented by pink-toned wallpaper. Who says that white and warm ivory don’t play well together? They certainly do in this dining room. 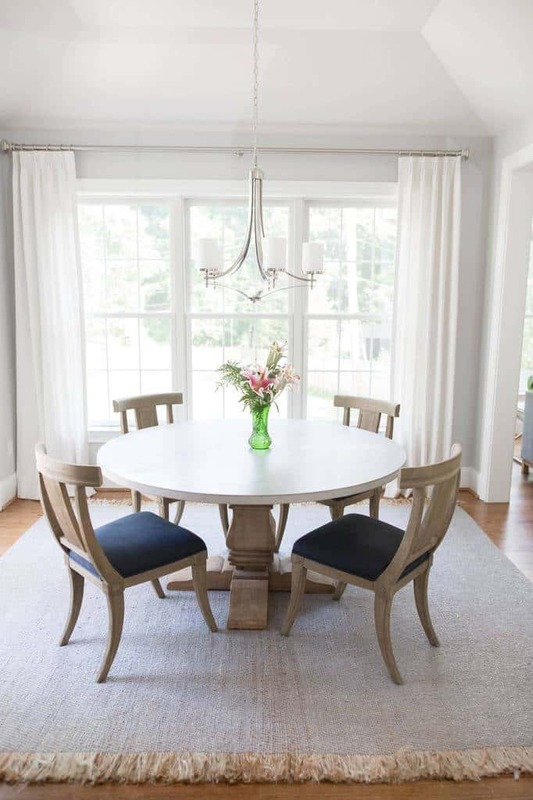 The bright white table looks beautiful surrounded by chairs of warm ivory. 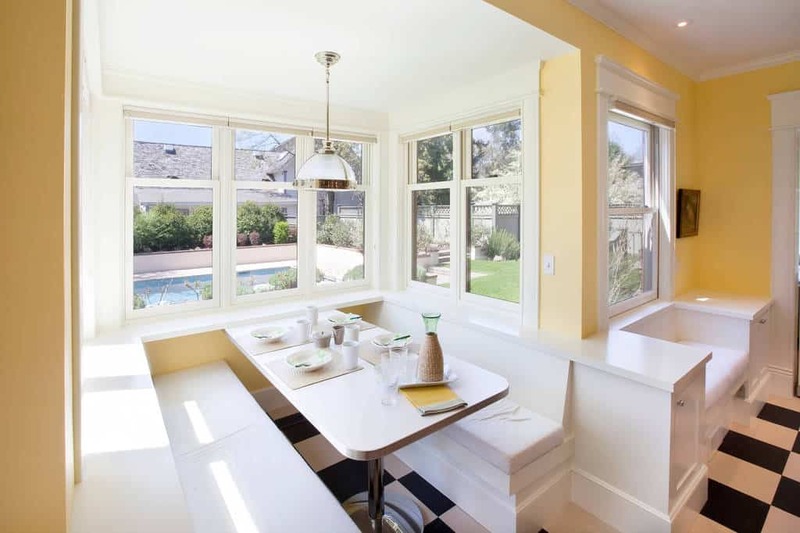 This charming little banquette is in a lovely shade of vanilla cream. This dining room features a large framed image of an outdoor scene that brings a hint of natural beauty to this pleasantly stylized space. A sort of montage of framed art prints creates an excellent point of interest in this dining room. This floor of classic hardwood looks especially gorgeous in the sunlight pouring through multiple windows. 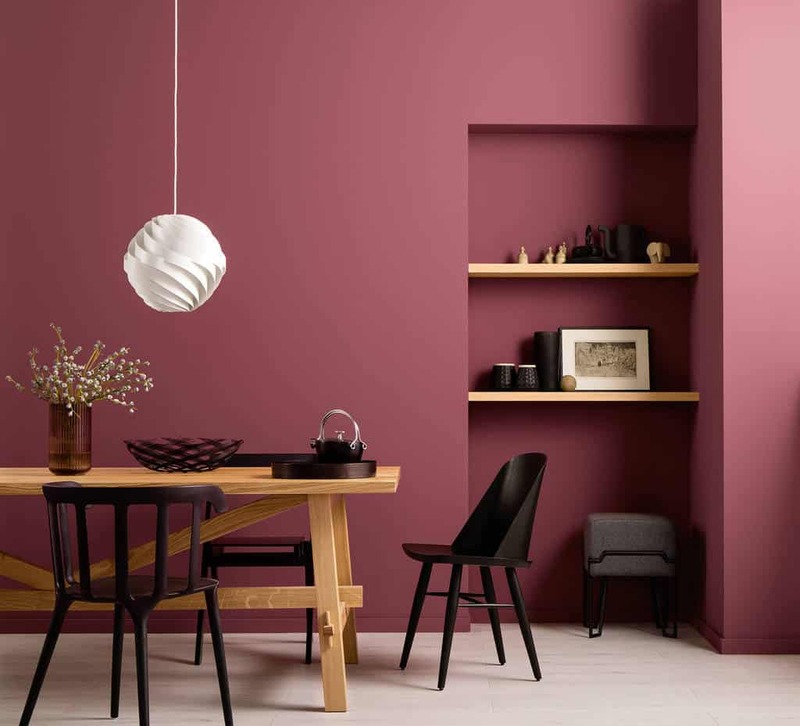 This lovely shade of light raspberry will brighten up your dining room. These chair seats boast a charming green print that complements the mint decorations on the table surprisingly well. 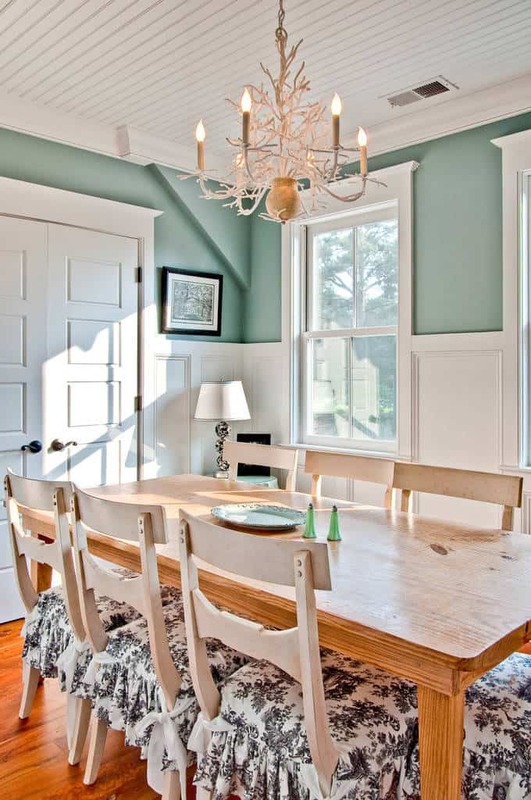 This dining room’s hanging lampshade light fixture adds an element of fun. 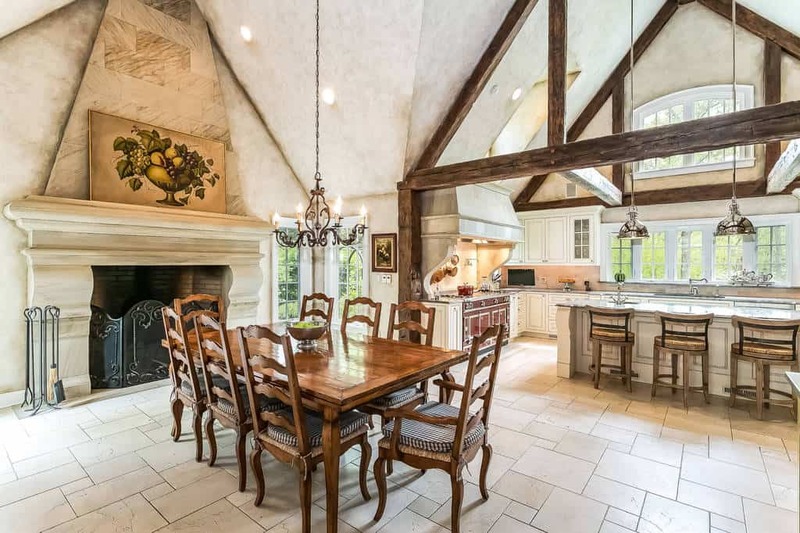 The combination of traditional chairs with Queen Anne chairs and rustic exposed beams conjures up images of the Elizabethan area. 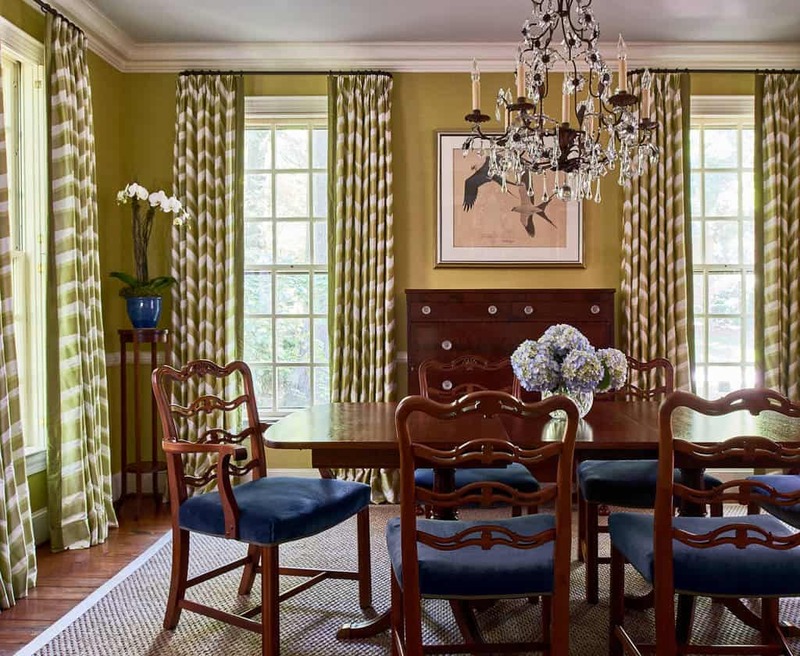 Using fabric chair coverings in a colorful shade can add new life to your dining room. Bright and cheerful decorations such as this dining room’s wall art will make your dining room a more inviting space. 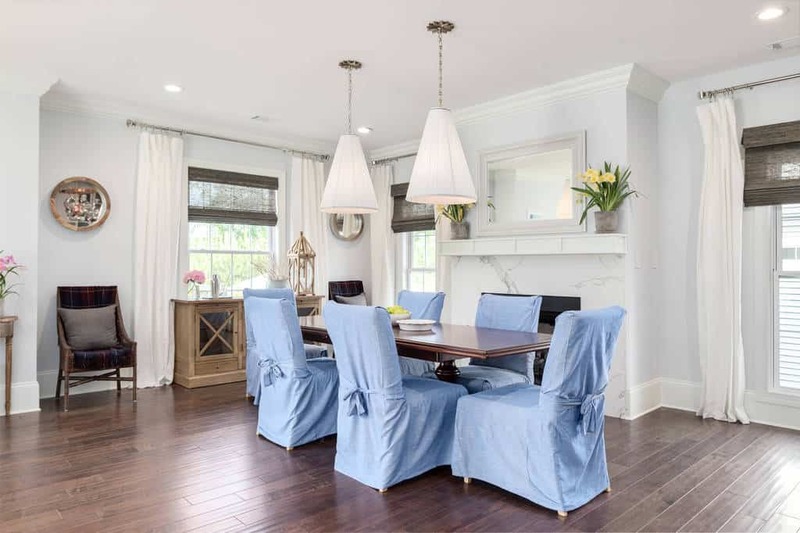 This dining room’s chandelier has a spectacularly icy appearance that is sure to get everyone’s attention, while its fireplace creates a hospitable atmosphere. 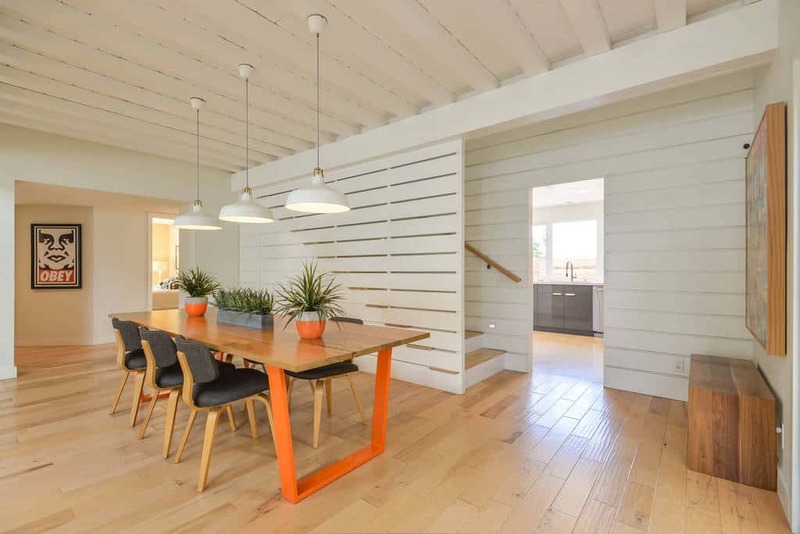 This table is positioned in the center of the room, successfully making your dinner the real focus of attention. Sheer curtains in a pale color allow more light to come through the windows, making for bright and cheerful breakfasts with family. 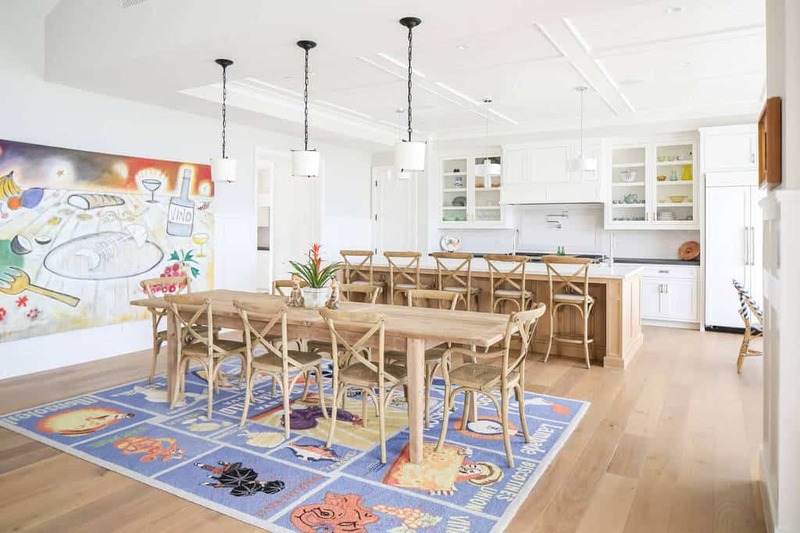 This energetic space seems just perfect for kids’ birthday parties. The colorful rug full of images as well as the picture on the wall will give the children lots to look at. 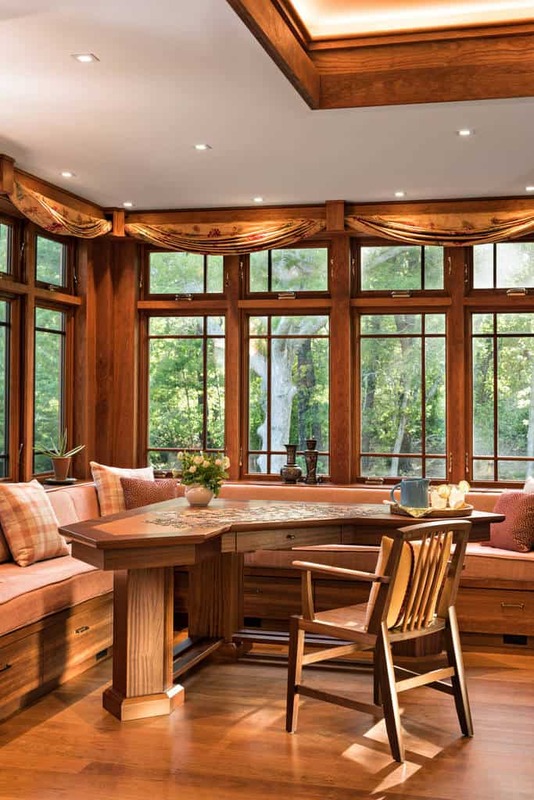 A group of four can have a cozy chat here, basking in the daylight allowed in by generous windows. This stunning room features an incredibly spacious china cabinet where you can display your porcelain. Photo by SINGLEPOINT DESIGN BUILD INC. 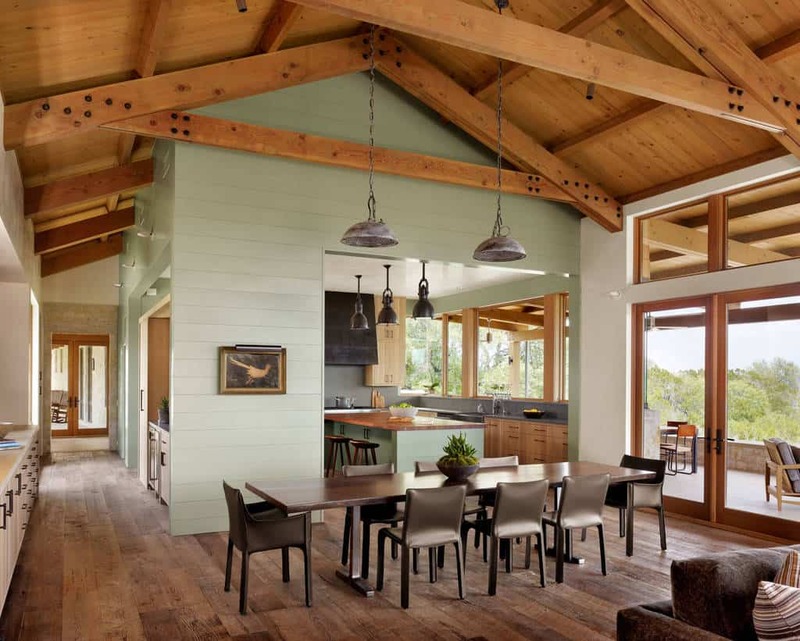 The combination of vaulted ceilings and exposed beams creates an impressive look. 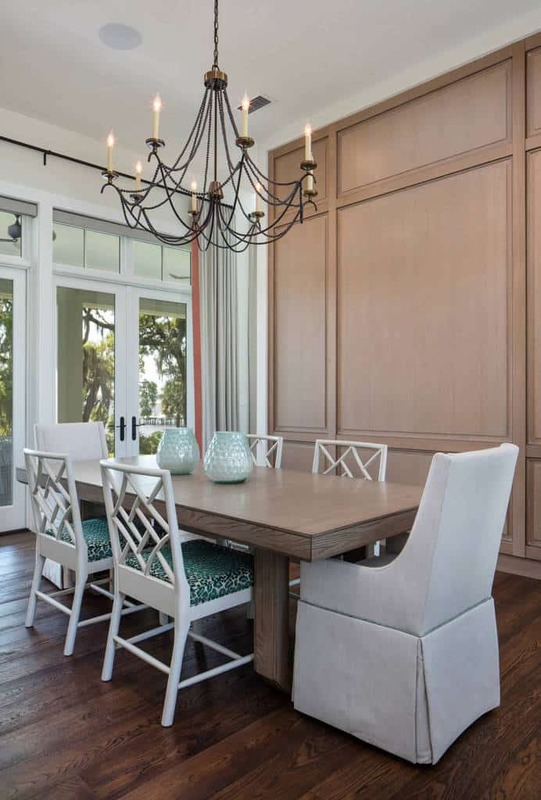 This lovely dining room features mint walls with white paneling, as well as extraordinarily glossy hardwood floors. This exotic and colorful rug is the most essential design element of this dining room. 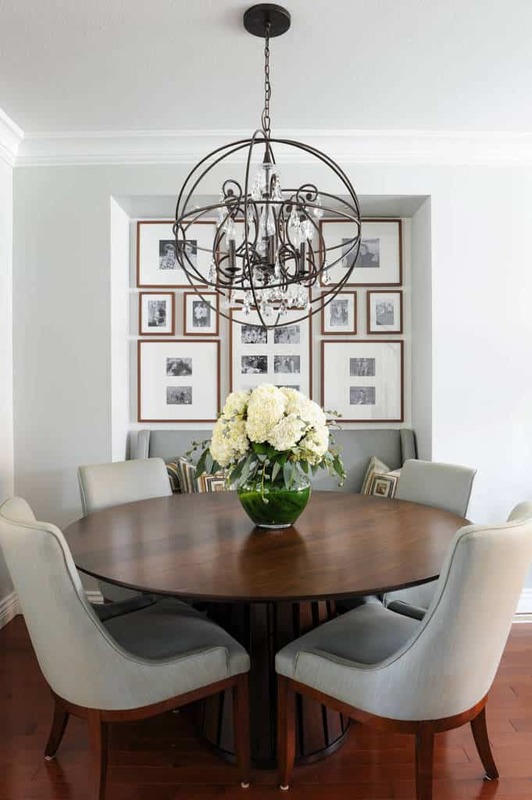 This dining room’s chandelier comprised of a number of spheres is a fascinating addition. The round cherry-wood table is another wonderful design choice. 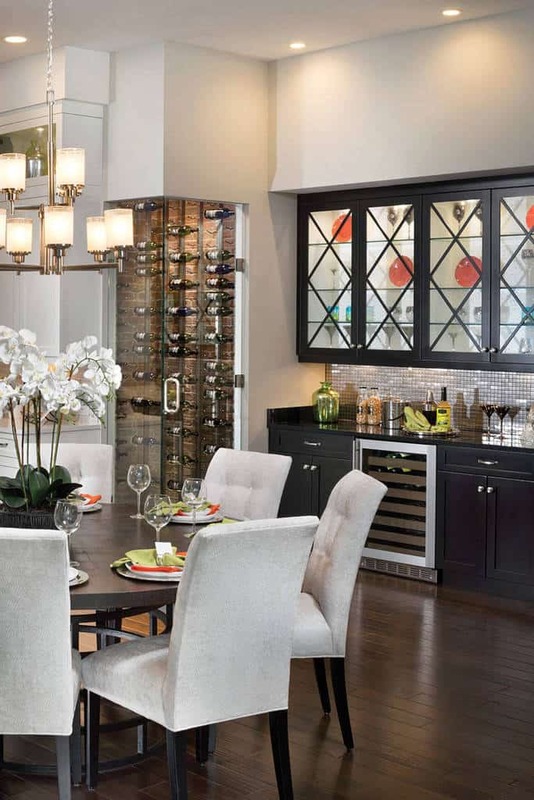 This dining room features a special wine cabinet with clear doors. 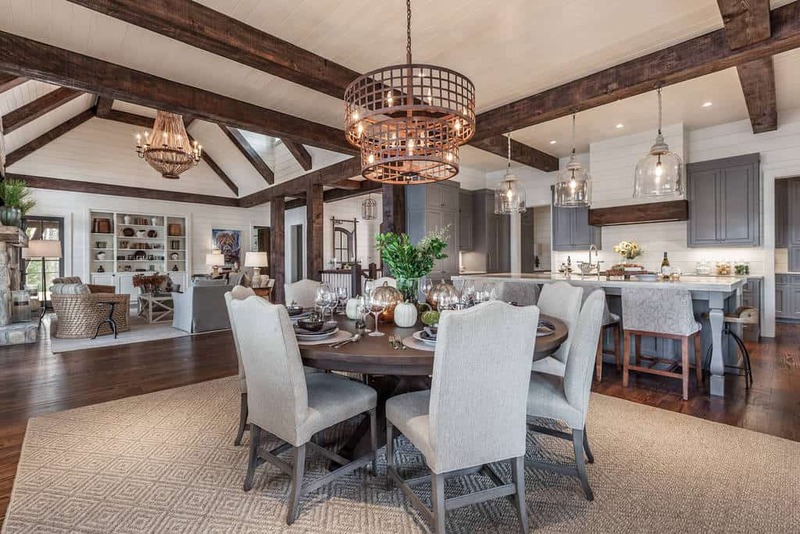 Rustic elements, such as this dining room’s exposed beams and weathered floors, add warmth to a space. This dining room’s bright white brick walls are unique and complement the rest of the room’s decor. 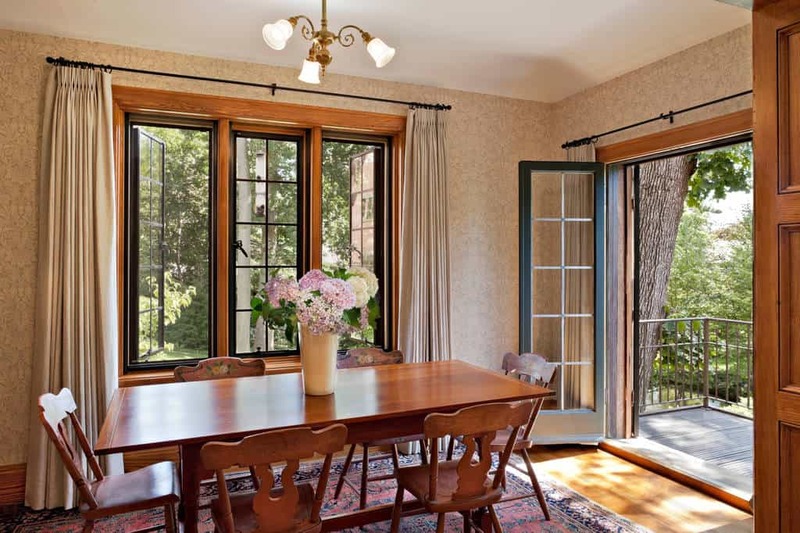 This dining room’s large door to the garden lets in fresh air and makes socializing after dinner easy. Navy blue is a popular color that can be used in almost any room. 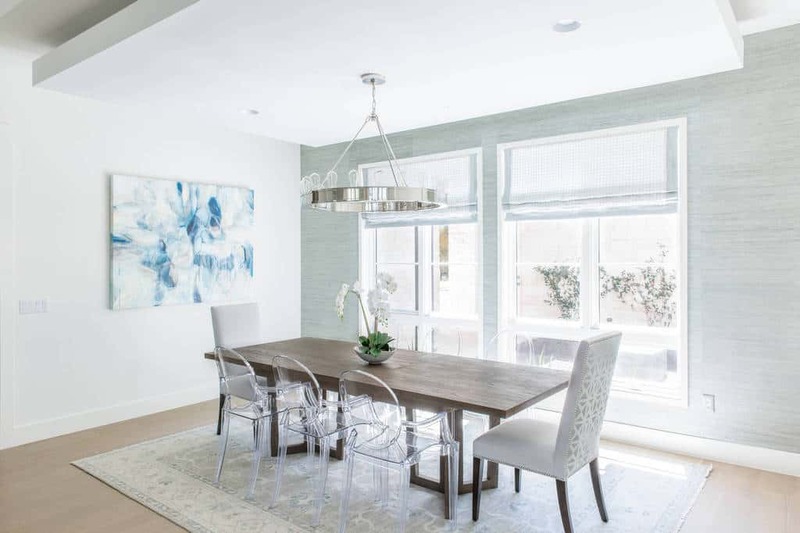 This luxurious dining room has pastel tones that add to the space’s general elegance. 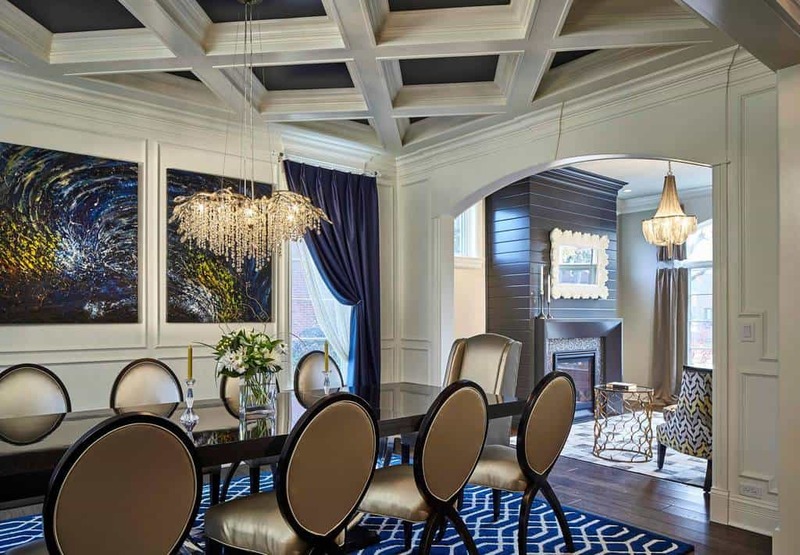 This stylish dining room’s latticed ceiling provides a greater sense of space. Brown and blue work brilliantly together, as evidenced in these chocolate and navy chairs. These textured olive green curtains harmonize nicely with the graphic wallpaper and hunter green ceiling. 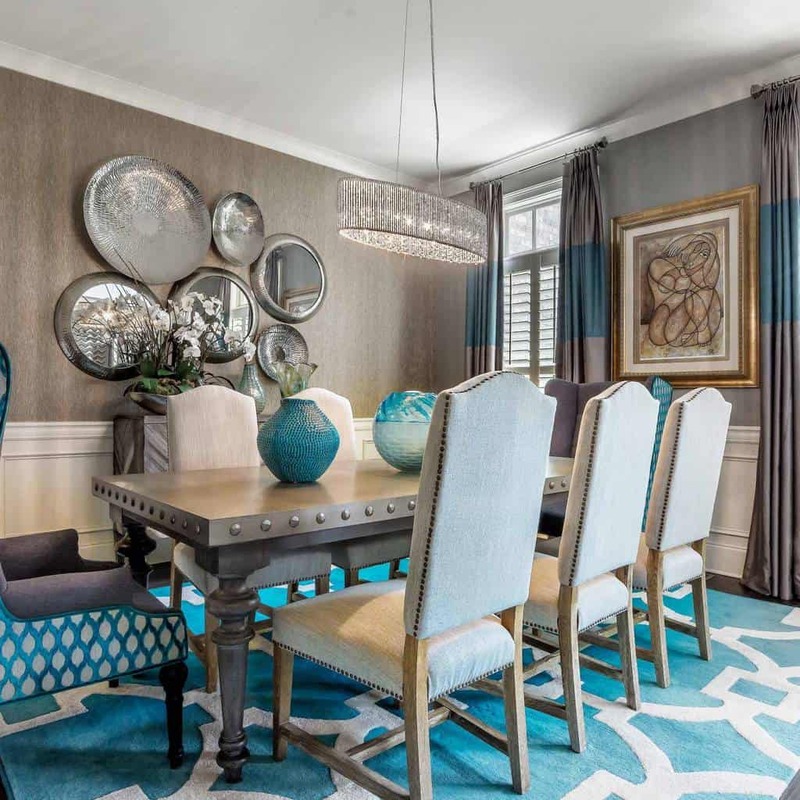 Aqua is a fantastic color for dining room design accents. 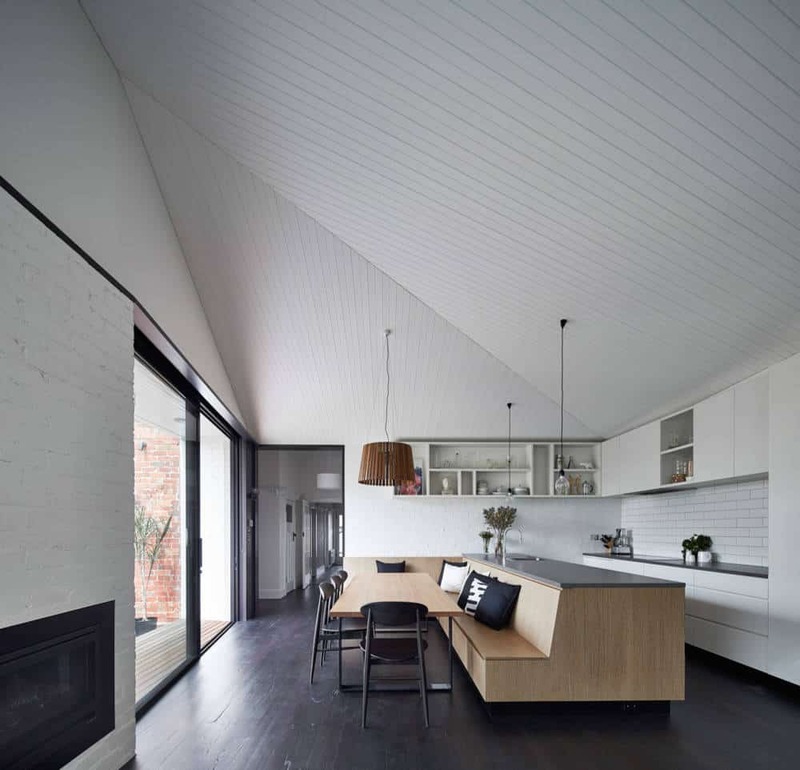 Lofty ceilings make this dining room seem more expansive. 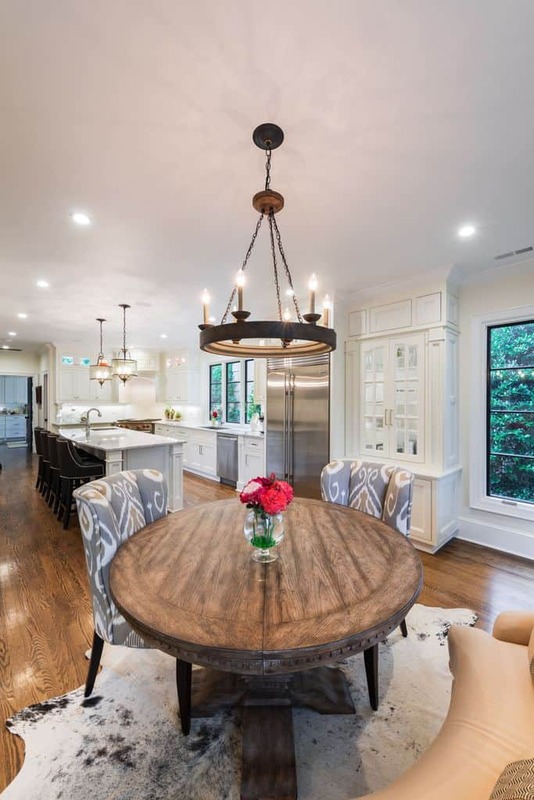 This dining room’s several chandeliers both light up the space and add to its stylishness. 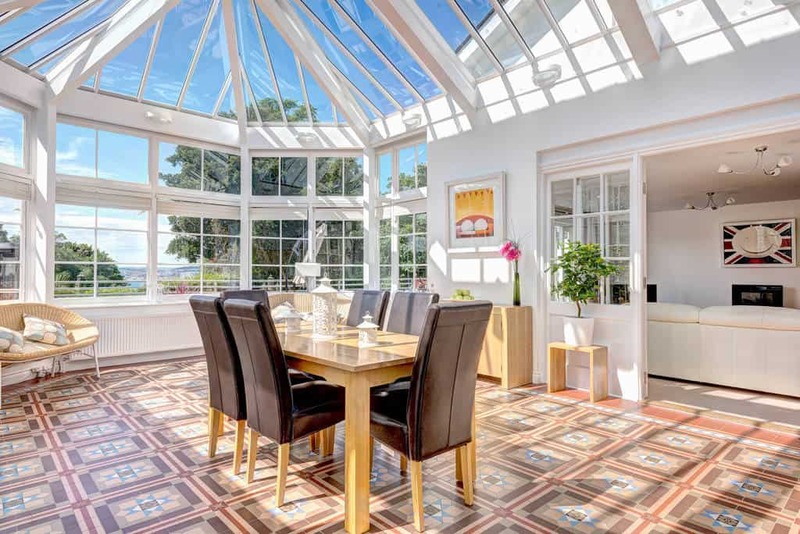 Understated pine floors help ensure the beauty of this dining room. 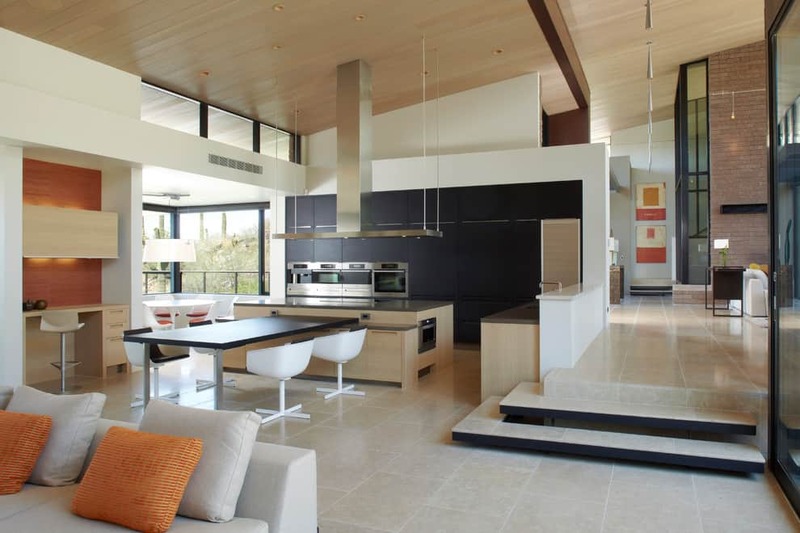 Decorative tile floors like this one will add liveliness and personality to your dining room. 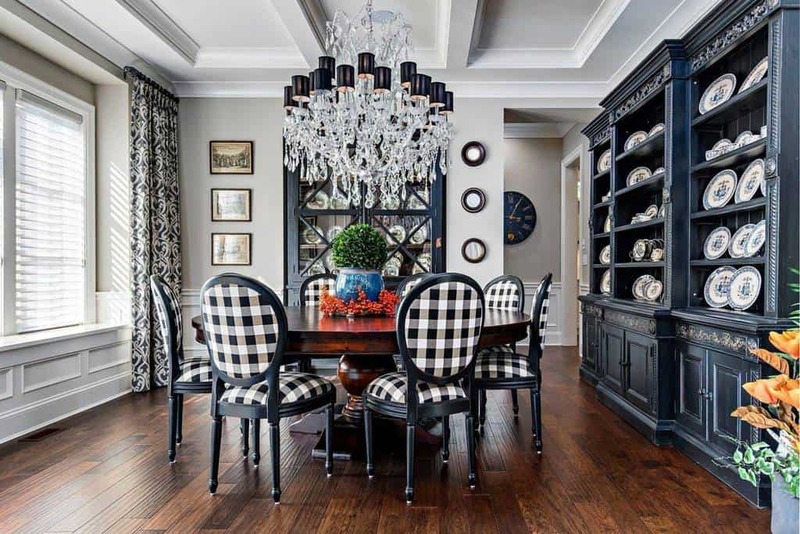 A black and white checkered floor adds vintage flair to this dining room. 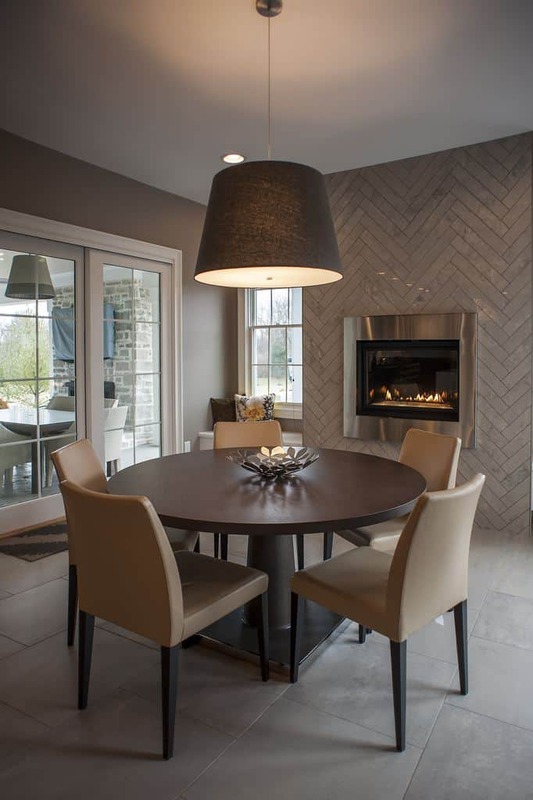 An electric or gas fireplace might be just the dining room addition you’ve been looking for. 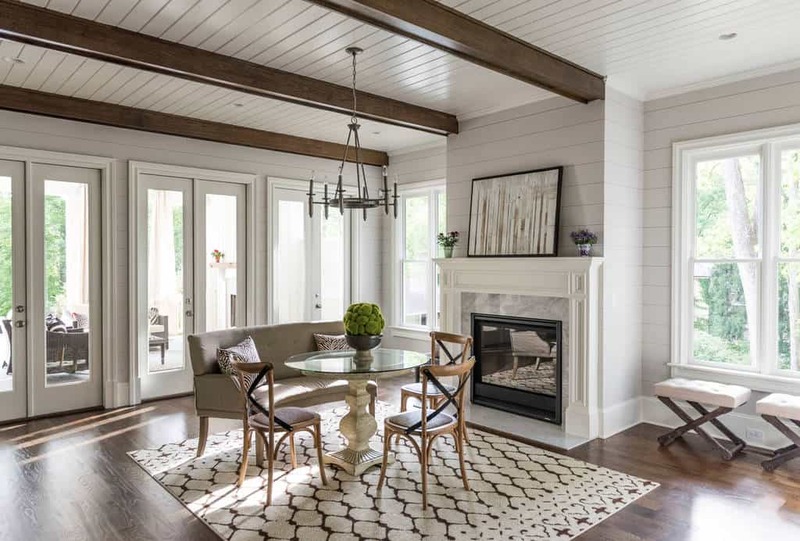 Incorporating some of these design elements into your dining room will add to its sense of hospitality and authenticity.